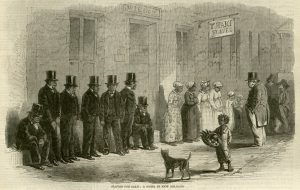 Formally dressed slaves stand in a line while an older white man examines them for purchase. The Illustrated London News, 6 April 1861. Courtesy of University of Missouri Libraries.